SharePoint related migrations are tough. There’s no getting away from that. Whether it’s moving from SharePoint 2007 to 2013 or SharePoint Online, Microsoft changes enough small items between versions of the product to make things awkward. As you might imagine, having produced effective migration tools and having worked on (and assisted) plenty of SharePoint and Office 365 migration projects we’ve got some experience in the field. As such, we thought we’d share what we’ve learned along the way. This process also includes what our clients’ feedback to us. This week, we’ll be focusing on Office 365 and the lessons we’ve learned whilst helping clients move into it. Potentially the most important point and it isn’t that technical. It’s a realization that Office 365 isn’t just one single application. As a user experience, it encompasses multiple things such as SharePoint, the Office Suite, Delve and more. From an IT technician’s view, the product stack includes Exchange, Yammer, Azure, SharePoint and Lync. Migrating content into each of these requires a different hat, per product, per team. Integrating the exchange platform might overlap somewhat with importing its content to Yammer for example but the differences do stop there. A migration project provides a great opportunity for teams to assess and sort out their files. In our experience, sadly enough this is an opportunity that's rarely taken advantage of. We’ve seen that more often than not, IT staff don’t challenge the management perception that a migration is a “lift and drop” exercise. If a user can do it on a desktop with one file, then IT should be able to move things in bulk just as easily right? Even with dedicated migration tools, like our own Sharegate. Migration is a perfect time to sort out files and content, and to think about a good spring cleaning. Challenging the belief that ALL content must be migrated and you can potentially save a lot of time. How many files aren’t accessed by staff anymore? Or how many documents are used so infrequently that they justify inclusion in migration efforts. Office 365 tenants have a threshold that works in the same way as a list threshold, which can be breached during migration projects. In such instances, all input to the cloud can be slowed or stopped entirely. Performing a little housekeeping on your SharePoint documents should be viewed as an essential step instead of a luxury. The next thing we’d share is that there's no getting away from manual intervention (even if you're inclined to ask for divine intervention at some stages)! Tools like Sharegate can be employed to do a lot of the heavy lifting for you (in so far as moving files, recreating permissions, mimicking current site structures and being platform agnostic). Having a man on the ground while a migration is ongoing is always recommended but we always encourage customers to keep time and resource available for post-migration site checks. Looking into how old sites compare to their older versions, making sure that the navigation and other GUI differences won’t confuse your end users are all things (amongst others) that will need to be addressed. And then there is working with the business to perform UAT testing before releasing the end product. Take the Sharegate security report called Check Permissions for example. It'll allow you to verify that no document is left checked out, check your site structure once you've generated its hierarchy, apply auditing, etc. The last point (and we like this one the most) is that migration projects don’t have to be seen as penance for past sins. With some careful planning and intelligent decision making, they can be pretty straight forwards. Breaking down tasks into smaller, manageable chunks right from the start removes a lot of the fear factor from migrations. Taking the opportunity to remove the clutter from the old system, working out what’s useful and then converting that into a newer, cleaner Office 365 deployment in which your firm will have access to newer and more powerful features can be pretty linear. It’s also a positive win for everyone involved. As said earlier, no tool can do everything for you but they can do an awful lot. And it’s worth realizing that not all utilities are created equal. Sharegate’s range of utilities is conscious to the differences between SharePoint migrations and Office 365 migrations, which makes life that little bit easier for IT staff using it. 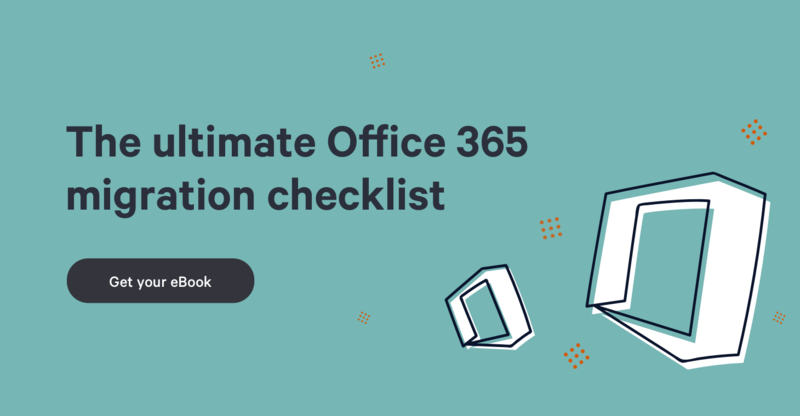 In closing, we’d like you to consider that these points can contribute to making your Office365 migration an easier journey. Questioning the validity on claims that ALL content must be moved can be a massive time saver, as can keeping enough time aside for human intervention to make sure that things are running smoothly. We also believe that not all migration projects need to be viewed with negativity and fear. Broken down into smaller, manageable tasks and assisted with the correct tool set – like Sharegate - migrations can be both rewarding and satisfactory for everyone involved. What migration lessons have you learned the hard way?